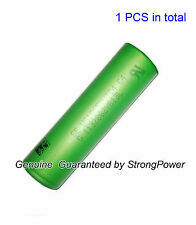 • 4 Sony VTC4 2100mAh 30A 18650 batteries 2 Free protections clear plastic case (each case can hold 2 battery). The Sony VTC4 is an unprotected, advanced battery. The overcurrent protective circuit or device shall operate discharging not to result in the risk or fire or explosion for over 30A discharging. Capacity: 2600mAh. (3.7 volts). Made in Japan. 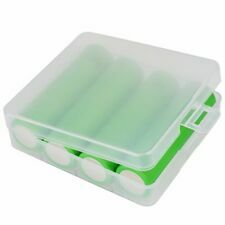 You will receive 4 batteries with 2 free storage cases. These are the flat top style as shown in the second picture. Usage of this battery is at your own risk! · Nominal Capacity: 3000mAh. · Size: 18650. Never leave charging batteries unattended. Never use a lot of strength on battery installation. Capacity: 3000mAh. SONY US18650VTC6. Model: SONY US18650VTC6. Battery size | shape: 18650 | cylindrical. Weight: 50g ·. Chemistry: NMC. Never leave charging batteries unattended. Never use a lot of strength on battery installation. 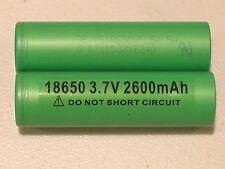 2 Pcs of Sony US18650VTC6 Batteries. Style: Flat Top. Be aware of the current limits in the specification and never exceed the number. 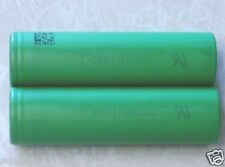 2X SONY VTC4 2100 mAh 18650 AUTHENTIC WITH CASE FREE SAME DAY SHIPPING! 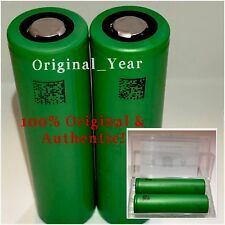 100% AUTHENTIC Sony VTC6 18650 3000mAh Batteries (2 Pc). Sony VTC6 18650 3000mAh Batteries(2 Pc) - Flat Top. 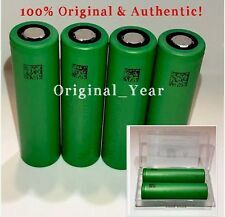 Authentic and high quality Sony batteries. Sony VTC6 18650 3000mAh Batteries Features Max capacity: 3000mAh. Authentic Brand New Sony VTC5 2600mAh Batteries. Free Shipping! 2 Sony VTC5 18650 Battery One free plastic case battery holder. The over current protective circuit or device shall operate discharging not to result in the risk or fire or explosion for over 30A discharging. 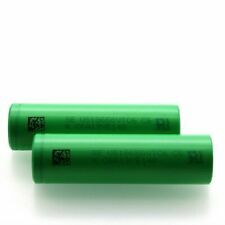 18650 2600mah 30Amp Battery Features: ---Size: 18650 (18mm diameter / 65mm long) ---Type: Li-ion (High Drain) ---Rated Capacity: 2600mAh ---Nominal Voltage: 3.6V / Peak Voltage: 4.2V ---Cut off Voltage: 2.5V ---Rechargeable: Yes ---Protected: No ---Style: Flat Top ---Maximum Continuous Discharging Current: 30A ---Nominal Voltage: 3.6V ---Maximum Charge Voltage: 4.2V. Form Factor 18650. Technical Data Product Information Height 65 mm. temperature 60 °C. Minimum Temperature -20 °C. Authentic Sony VTC6 IMR 18650 3000mAh 30A 3.7V High Drain Li-Ion Battery. Sony VTC6 3000mAh 30A. 1xSony VTC6 30 00mAh 30A 18650 bat tery. Capacity: 3000mAh. Never keep a spare battery in your pocket or purse without a plastic case. Capacity: 3000mAh. Battery size | shape: 18650 | cylindrical. Protection circuit: Unprotected. Top style: Flat top. 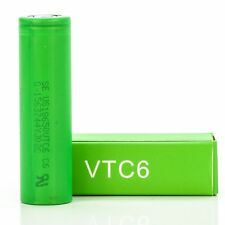 1x Sony VTC5A 18650 2600mAh/25A. Sony VTC5A Specifications as rated by Sony Energy. Model: US18650VTC5A. Nominal Capacity: 2600mAh. Size: 18650. The user must have appropriate understanding of lithium ion batteries when charging, discharging, and assembly before use. VTC5 model with 2600mah capacity able to provide lots of clean energy for high drain or low drain devices manufactured by one of the largest battery makers. Capacity: 2600mAh. Resistance: 15mΩ. Net weight: 44g. Capacity: 3000mAh. Battery size | shape: 18650 | cylindrical. Protection circuit: Unprotected. Never use force to install. Never keep a spare battery in your pocket or purse without a plastic case. Do not expose to heat. Trending at $25.49eBay determines this price through a machine learned model of the product's sale prices within the last 90 days. (3.7 volts). Made in Japan. You will receive 4 batteries with 2 free storage cases. These are the flat top style as shown in the second picture. So that is why the confusion. Capacity: 3000mAh. Smart phone users can download a QR code scanner and scan the codes of the batteries. Genuine Sony US18650VTC6 3000mAh Batteries. Chemistry: NMC. Never leave charging batteries unattended. Never use a lot of strength on battery installation. Style: Flat Top. 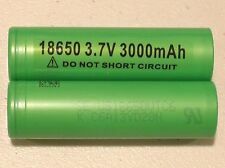 2x VTC5A Battery. Rated Capacity: 2600mAh (High Drain). Style: Flat Top / Color: Green. 1x Battery case. 6 Sony 18650 VTC4 2100mah RECHARGEABLE BATTERY 30A DISCHARGE 3.6V HIGH DRAIN.